We were very happy with LG’s G6 when it released at the beginning of this year, but it was overshadowed by the Samsung Galaxy S8 and S8 Plus. In the months since then, nearly every company has released a new model with a nearly borderless 18:9 screen and a Qualcomm Snapdragon 835 processor, and so the G6 is somewhat difficult to recommend despite its excellent feature set and capabilities. Thankfully, LG refreshes its portfolio twice a year, and we have the new flagship LG V30+ with us now. This phone finally brings LG up to date in terms of raw performance, with the Snapdragon 835 processor that the G6 had to miss out on. It also wins more style points, with its gently rounded surfaces. The real question will be whether it’s more attractive than today’s top offerings – the Samsung Galaxy Note 8 (Review), Google Pixel 2 series (Review), Apple iPhone 8 (Review) series, and OnePlus 5T (Review), amongst others. The V30+ ditches the secondary screen that set its predecessors apart, and instead just has one big screen covering its front face like so many other phones today. It’s pretty big, at 6 inches diagonally with a resolution of 1440×2880. LG has used an OLED panel, and it supports HDR10 for vivid colours and better contrast in HDR content. The screen also has the same rounded corners we first saw on the G6. Whereas previous V-series phones felt chunky, the V30+ is extremely slick, with curves in all the right places. The rear glass and is rounded at the sides to meet the shiny metal frame. LG has used Corning Gorilla Glass 5 on the front, and it also has rounded edges. We were happy to see a black front face on our silver demo unit, because it makes the screen look more seamless. The rear glass has a subtle pattern that catches the light when you move it around. Both the front and back are extremely reflective and slippery, which might be a problem over time. At the back, we see LG’s dual-camera module, and thankfully the bump protrudes by barely even 1mm. 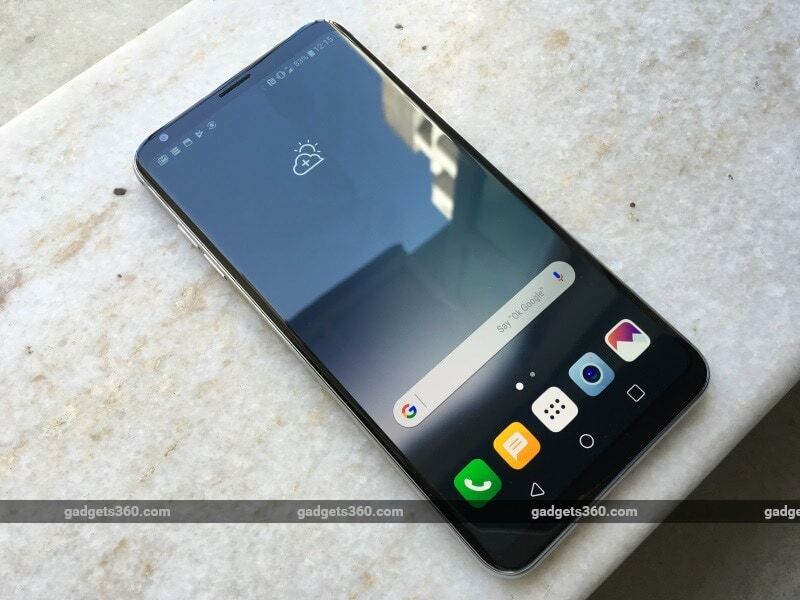 Below it is LG’s signature rear-mounted power button and fingerprint sensor which is still going to polarise potential buyers. Lower down, we can see a “Made in India” stamp and some regulatory text. The volume buttons are on the left, and a hybrid dual-SIM tray is on the right. This means you have to choose between a second SIM and a microSD card for storage expansion. There’s a 3.5mm audio socket on the top, and a USB Type-C port with a single speaker next to it on the bottom. Apart from the Snapdragon 835 processor, you get 4GB of RAM, 128GB of storage, Bluetooth 5.0, Wi-Fi ac, a 3300mAh battery, Quick Charge 3.0 and wireless charging, and IP68 water and dust resistance. There’s a particular focus on sound quality, with HD audio recording, MQA (Master Quality Assured) support for high-quality audio streaming, and a high-end DAC for audio playback. Plus a high-end LG QuadPlay headset included in the box. LG uses a custom Android skin with quite a few custom features. You can switch between single-layer and dual-layer UIs, and there are lots of extra features to discover in the Settings app, which has been subdivided into tabbed sections. Most notable is the “floating bar” shortcut menu which is essentially a virtualised version of the second screen on previous V-series models, that you can position anywhere on screen and summon with a quick swipe. You can create GIFs on the fly by cropping a section of the screen, and switch sound profiles automatically depending on your location. To offset the inconvenience of the power button being on the back, you can double-tap the menu bar anywhere to lock the phone, and use face recognition to unlock it. The camera app has a lot of features including “Cine Video” mode that lets you choose from stylistic filters and adjust their intensity. There are also collage modes that use the taller screen to help you frame multiple shots. LG has stuck with its previous arrangement of one standard lens and one wide-angle lens, and you can switch between them even while recording video. In our limited time with the LG G6, we found that the display is extremely bright and vivid, sometimes feeling too saturated. Performance is excellent, and though the UI has a lot of bloat, there were no slowdowns at all. We took a few photos, and while they looked great on the phone’s screen, we’ll examine them in more detail in our full review. Our initial impressions are that low-light photography should be one of this phone’s strengths. 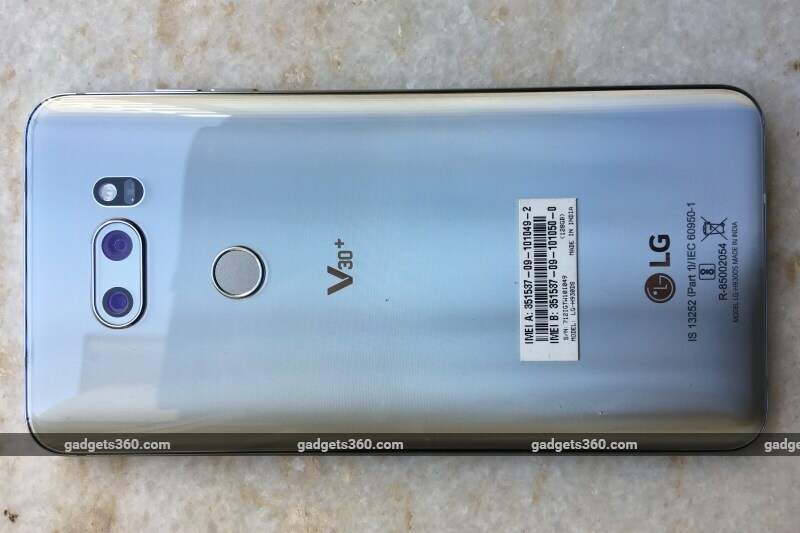 Unlike in other countries, LG isn’t launching the non-plus V30 here. The only differences between the two models are that the lower-end version has 64GB of storage and ships without high-quality earphones. Overall, the LG V30+ looks like it could be a solid competitor in the high-end space. Stay tuned to Gadgets 360 for our full review, which will cover the phone’s performance, cameras, battery life, and everything else in much more detail.